Convert MKV files for viewing on iPad, Xoom, Android phones, etc. Convert MKV video with wanted audio/subs track and video stream. Guarantee audio and video in sync with fast conversion speed. Merge multiple MKV files into a single file. Cut off black edges and select wanted video clips to convert at will. Besides converting MKV, the Mac Video Converter can transcode MTS, MXF, TiVo, MOV, TS, VOB, AVI, and FLV files. 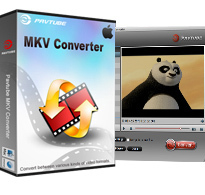 Pavtube MKV Converter for Mac is a splendid MKV Converter particularly developed for Mac OS X users. It can convert MKV container format to a wide range of other video/audio formats for your different end uses with fast conversion speed and excellent quality. The output formats include TS, MP4, FLV, AVI, 3GP, MOV, M4V, MPG, WMV, MP3, WMA, AAC, etc. Pavtube MKV Converter for Mac supports converting MKV videos for using on almost all popular multimedia devices, including Apple TV, ATV 2, iPad, iPad 2, iPhone, iPhone 3G, iPhone 4, iPod, Motorola Droid (X), Nexus One, HTC Droid, HTC Hero, Xoom, Galaxy Tab, and more. If your MKV source file contains multiple audio/subs tracks and video streams, you can freely select your wanted ones to be preserved in the converted files. If your source file contains chapter info, then Pavtube MKV Converter for Mac is able to display all of them, and allows you to select a certain chapter to convert at will. Pavtube Mac MKV Converter takes full advantage of the advanced multitask and multithread encoding technology. Its conversion speed is 1.5 to 2 times faster than other similar programs. Pavtube MKV Converter for Mac adopts AV-sync conversion technology, which can ensure the audio synchronize perfectly with the video. This program support exporting a variety of output formats, including FLV, MP4, MPG, AVI, MOV, TS, VOB, SWF, and so on. Pavtube MKV Converter for Mac lets you set video effect by changing brightness, contrast, saturation, volume of the video, as well as add special effects to the video. The special effects range from Simple gauss blur, Simple laplacian sharpen, Aged film, Flip color, to Invert. If you want to combine several MKV files into one file, you can tick off the option "Merge into one file" to do that. You can make use of "Crop" function to cut off black edges of the video, and use "Trim" function to select a certain clip of the video to convert. iPod, iPad, iPhone, iPhone 4, PSP, Apple TV, Gphone, Blackberry, Creative Zen, Xbox, Androids like Motorola Droid, HTC Hero, HTC Magic, HTC Evo, Google Nexus One, Samsung Galaxy S, Samsung Galaxy Tab, 3G mobile phones, and other mobile pohnes. The Installer could not instal some files in "/Applications............Contact the software manufacturer for assistance. MKV to AVI-How to convert MKV to AVI on Mac OS X? - Introduced German as an optional user interface language. - Added format templates to support iPad 3, Asus Transformer Prime, etc. - Added Library settings in Option. - Optimized Apple ProRes profile for better processing with Final Cut Pro 7.